Today we are making pumpkin cinnamon rolls, because fluffy, super soft and delicious. It’s my new favorite pumpkin treat this fall. 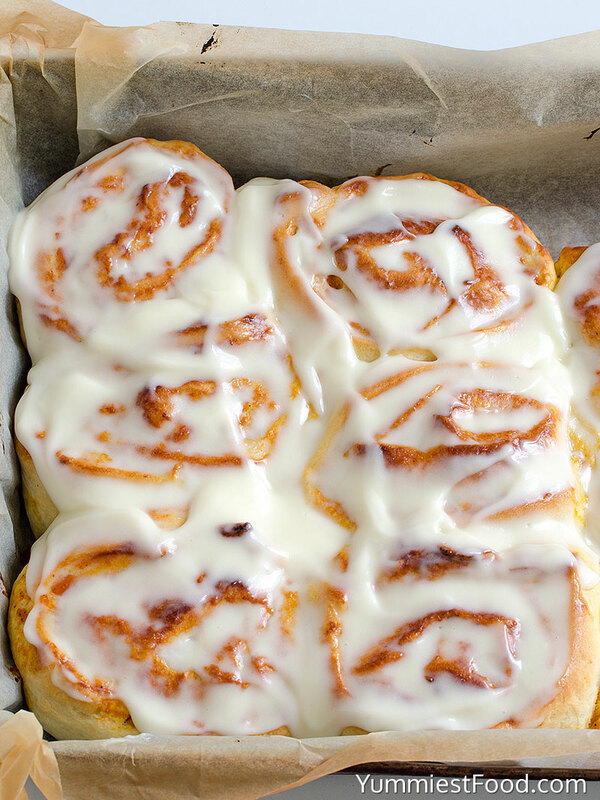 Your kitchen will smell so amazing after these homemade pumpkin cinnamon rolls with cream cheese frosting are done baking. 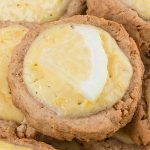 These rolls smell absolutely wonderful baking in the oven, and this is a recipe that my family enjoys quite a bit. The pumpkin flavor in these rolls gives them a little special something, and the easy glaze sends them over the top. 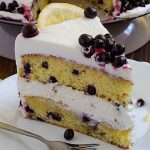 I have got this recipe from my best friend. I was impressed by the look of these rolls and also I like the taste very much. For me this is great recipe. 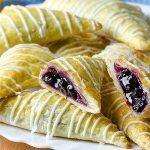 I made it very often in my kitchen and my whole family loves them! Weekend is coming and I know what I am going to prepare. I love when on Sunday mornings my kitchen smell on pumpkin and cinnamon that guarantee good mood. I love weekends because family is together and I especially love these Pumpkin Cinnamon Rolls. Pumpkin is my favorite ingredient. It has very nice taste and it is good for combinations. 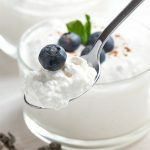 I like it in salty way in soups and especially in cakes and desserts and when I got this recipe I concluded that there isn’t batter taste than this. These Pumpkin Cinnamon Rolls are very moist, fluffy and smelly and I can eat them every single day. I like to make experiments in the kitchen and that is the case with these rolls too. I tried many different combinations and I can say that every combination give us great result! 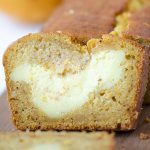 I made combination with cinnamon and pumpkin because my family likes it the most. This is version which I like the most and I must share it with you. These rolls are perfect because they are fresh and nice even a day after so I know that I made very good combination. 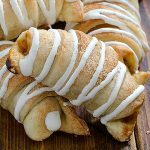 Pumpkin Cinnamon Rolls are very tasty when you eat them hot and in combination with good frosting. This is our favorite way. Don’t worry about dough and of making these Pumpkin Cinnamon Rolls I was worried too but when I made them for the first time I concluded that it isn’t very hard at all. 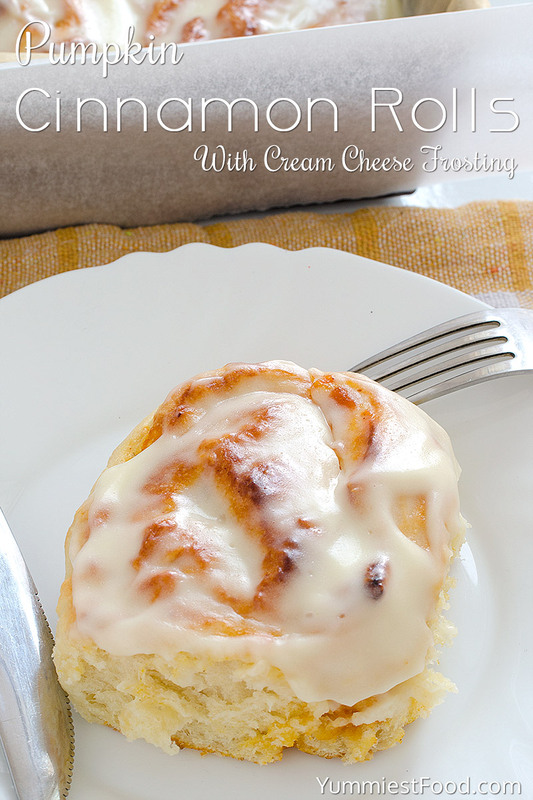 These Pumpkin Cinnamon Rolls are very easy to make and you can make them for a very short time. 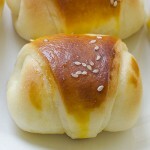 I hope that you will try to make these delicious fall rolls. Bake your Pumpkin Cinnamon Rolls, let them cool down and enjoy! 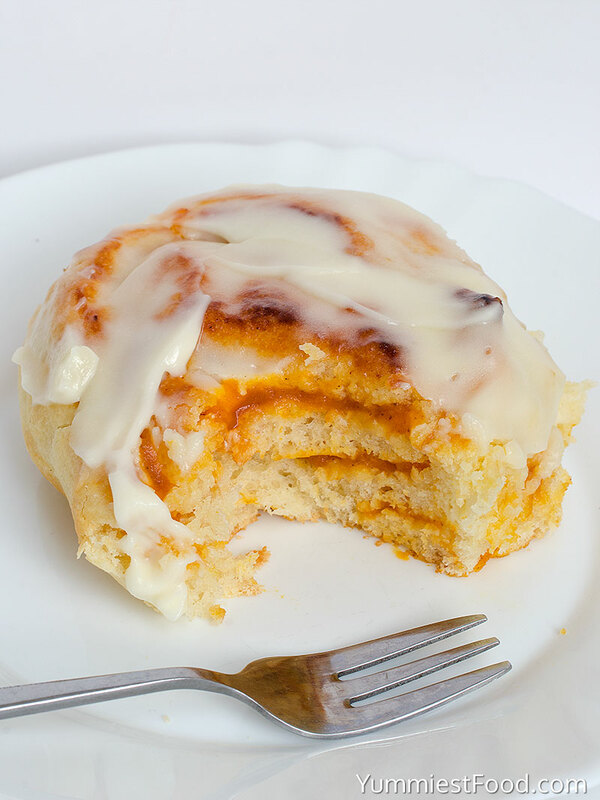 Pumpkin Cinnamon Rolls - super soft, moist, fluffy and delicious! 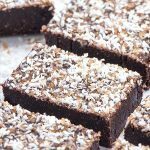 Quick and easy dessert for perfect fall enjoyment! Then on a flat lightly floured surface or a silicone baking mat roll the dough into a rectangle shape about 14 by 9 inches in size. 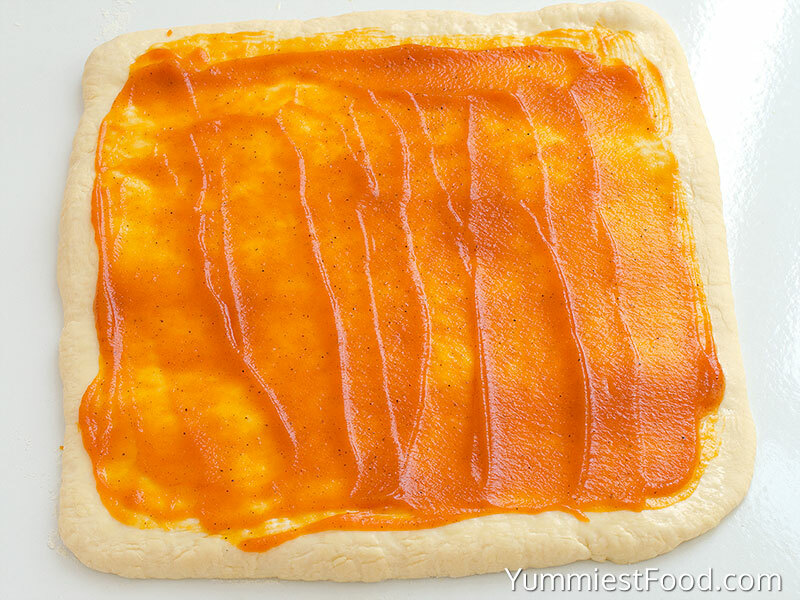 Spread the ¼ cup of very soft butter over the rectangle and sprinkle the pumpkin filling over top, leaving an border of about ½ inch on each side. 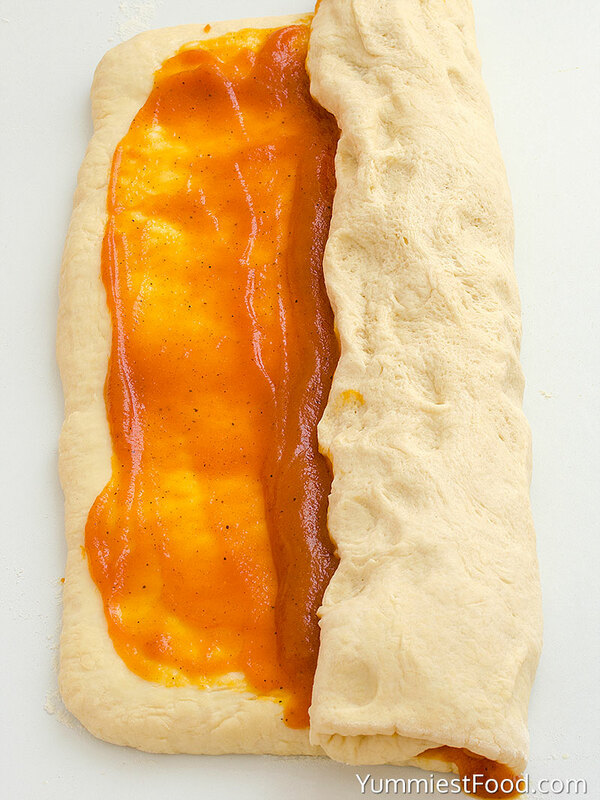 Then starting at the short edge of the rectangle, roll the dough into a roll and pinch the side closed. Using unflavored dental floss or a very sharp knife cut the roll into about 8-10 slices, each about 1 inch thick.